Can The Duchess Satisfy Our Need For Bodice-Ripping Dramz? The duke ought to be the villain of this piece, and, in fact, he is, but it is the wonder of Fiennes' performance that it is not only a marvelous portrayal of absolute power in the flesh but also the most sympathetic portrait of a man who, by rights, shouldn't have even the tiniest drop of our regard. Twice Oscar-nominated (for "Schindler's List" and "The English Patient"), Fiennes works in the subtlest ways, layering in everything from how he carries himself to the way unstated emotions are hinted at by his stone-like face, to present someone who can't help being who he is. Thanks to Fiennes, we come to understand the enigmatic duke as the immovable object deeply perplexed at having to contend with the unstoppable force that is his wife. It is a quietly complex performance almost beyond words, and it overshadows all the gorgeous pictures that are its elegant frame. At a certain level, The Duchess is a parable, possibly even a fantasy, about female empowerment. Fortunately for us, however, it does not linger often or long at that level. As movies like this go - stately homes constantly arustle with the sound of lingerie falling gently to the parquet floors - it is quite a lively, and even occasionally a rather touching, piece. Though it does have occasional elements of a bodice-ripper romance, the engaging story is distinguished by sharp writing and strong acting. This is a highbrow and elegant chick flick that outstrips the likes of The Women or other insipid movies targeted to females. The Duchess explores the nature of celebrity and charisma. Most compellingly, it chronicles the saga of a vibrant and forward-thinking woman hampered by the constraints of a rigid society. The raw material here would be a pile of riches for any actress to dig into, and the screenwriters give Knightley plenty to work with. (The script was adapted by Dibb, Anders Thomas Jensen and Jeffrey Hatcher, the last of whom is the screenwriter, and playwright, behind "Stage Beauty," as well as the writer of the underappreciated bonbon "Casanova," starring the late Heath Ledger.) And Knightley doesn't let them down. I've come a long way with Knightley over the years, from finding her almost unbearable to watch (I just couldn't get past the skeletal planes of her face) to falling in love with her circa "Pride and Prejudice." Knightley's performance here veers gracefully from the charming to the devastating: One minute she's giggling as she plays cards with her cherubic little offspring; the next, she's crestfallen when she realizes that her husband is determined to choke off all her life's happiness. (Fiennes' performance here is wholly without vanity: He holds nothing back in playing a loathsome, stubborn character, though he still manages to let glimmers of humanity peek through.) Everything Knightley does rings true and clear — she defines the character of Georgiana in a way that's not anachronistic, nor modern in a forced way, but timeless. That's a lot to ask of a young actress, but Knightley is up to the task. Her Georgiana is history with a human face. A big-boned beauty who leads with her jaw, Ms. Knightley looks pretty as a Gainsborough picture in and out of her silks and satins, but she's not a remotely composed one. Though now 23, she still tends to throw herself around the room like one of those jangling adolescent girls who, arms and legs pinwheeling, heads bobbing like Halloween apples, have yet to adjust to their newly sprouted bodies. (Modigliani would have loved the willowy bend of her neck if he could have persuaded her to stop fidgeting.) She's not much of an actress - she pops her eyes instead and thrusts out her chest - but she doesn't need to be Helen Mirren if she can cultivate a real screen presence. Stillness would become her, as would a good director. To some extent, The Duchess recalls Sofia Coppola's Marie Antoinette, in that it's about bed-hopping and courtly ritual during a time of revolution. Dibb isn't interested in delivering an audience-unfriendly art film, though. His Duchess is thoroughly populist and middlebrow, full of all the high wigs, thick powder, perfect diction, and straightforward dialogue that define bodice-ripping prestige pictures about silently suffering souls. Knightley's brand of muted iconoclasm has always been well-suited to just these kind of coach-and-corset movies, and as a result, the story of her character's fall from idealism to practicality becomes fairly moving. Dibb and company make too much of the parallels between Georgiana's story and that of her most famous descendent, Lady Diana Spencer, but at the same time, the "ironies of fame" material works well-not because of its specific application to the aristocracy, but for how it relates to the commoners. Lots of people dream of better lives for themselves and the citizens of the world. And lots of people stop short when they realize they need to stay home and tuck their kids into bed, so the next generation can have their own unfulfilled dreams someday. attitude, her Vogue-worthy eyebrows, and her athletic build (no matter how impressively those long limbs are encased in complicated gowns of satin and silk) lend an attitude of now-ness to a production that wants to be part historical biopic, part tabloid-relevant. (Director Saul Dibb has a background in documentaries.) Knightley, now 23, is not a very deep interpreter of her roles (whether in Atonement or the Pirates of the Caribbean trilogy), nor is she as hip as Kirsten Dunst and the rest of the in crowd who cavorted in Sofia Coppola's fashion-forward Marie Antoinette with downtown élan. But that hardly matters in The Duchess. Every turn is telegraphed, but Fiennes's duke is a fascinating stiff-uneasy with his privilege but ruthless in using it. Not only is Knightley most excellent, her starved-supermodel look adds an affecting subtext: that the economic impact of male disapproval still inhibits women's freedom. How Georgiana exploited both her celebrity and her instinctive empathy with commoners to drum up electoral support for her close associate, Lord Charles Fox (an underused Simon McBurney), is dealt with only superficially. Though equally apolitical, Sofia Coppola's "Marie Antoinette" displayed more insight into its subject (an acquaintance of Georgiana's, and arguably the less interesting figure) than "The Duchess" manages with its more straightforward reading of history. While Knightley ably embodies Georgiana's easy wit, occasional naivete and ahead-of-her-time common sense, her performance is somewhat diminished by its familiarity and the film's reductive view of its protag. And as lovely as the actress is, all that finery can have a smothering effect; she looked more radiant amid the sweat and squalor of Joe Wright's "Pride & Prejudice." The melodrama is a bit bloodless, though, figuratively and literally. This is a not-uninteresting chapter during an exciting time in British and European politics — neither the American nor French revolutions get mentioned — but writers Dibbs, Jeffrey Hatcher and Anders Thomas Jensen find no way to connect us with these distant personages. Probably the most surprising thing to a modern audience is how aristocrats engage in the most intimate and embarrassing conduct in full view of servants who are treated as little more than furniture. 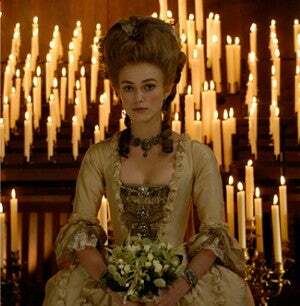 'The Duchess' opens today in limited release.